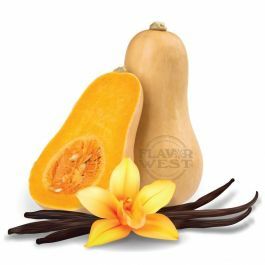 Vanilla butternut flavor comes with hints of butternut. Sweet and full of butternut alluring aroma and a delightful taste. Type: Vanilla butternut water soluble flavoring. Ingredients: Natural and Artificial Flavoring, and Propylene Glycol. USP Kosher Grade Flavoring. Usage Rate: 15-20% for E-use. Flavor suitability: Desserts, cakes, pastries, smoothies, drinks, candies and more. Specific Gravity: 1.07 No Refunds on Flavoring. I first got this flavor from my one time fav vape site. It was discontinued, I discontinued doing business with them because of it. I can't help but think it's the name that is off-putting for people, too bad. People are missing out on a mild yet rich flavor that is unimposing. I have been focused on 'baked goods' flavors for years. This is more like sweet cake than anything else I can think of. I find the balance to be nearly perfect. It's characteristics make it well suited to mixing to flavors that need a bit of mellowing or neutralizing. I didn't think I'd like this but I absolutely love the taste. I make Eliquid for family and friends and so far everybody begs for more of this one. Very tasty at 15%. My favorite.